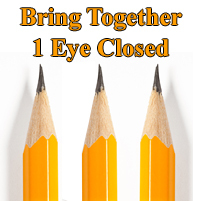 Can You Bring 2 Pencil Points Together with One Eye Closed?Can You Bring 2 Pencil Points Together with One Eye Closed? Hold a pencil in each hand. Close 1 eye. Can you bring the pencil points together so they touch? Sounds easy but most people find it quite a bit harder than it sounds. With 1 eye closed you don’t have nearly the depth perception as with 2 eyes. How about bringing together presentation skill development AND fun? Sign up for our after school magic or circus classes this semester. Contact us or your school to see if we are offering classes at your school. If not, contact us and let’s get one started.